SOLID TIRE RUBBER COMPOUNDS – WHAT’S THE DIFFERENCE? Solid tires are the go-to tires for demanding industrial applications. They boast a long service life and high durability, especially when compared with their air-filled and foam-filled pneumatic counterparts. They are also 100% flat-proof, unlike air-filled pneumatic tires. 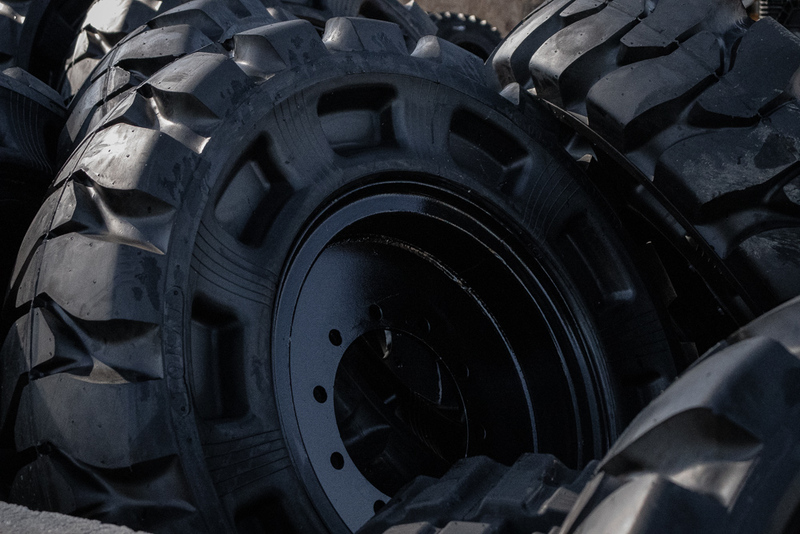 Solid skid steer tires are well-suited for a wide variety of applications, from demolition to mining to waste transfer stations to general construction. These tires are made from tough, resilient rubber compounds that make them puncture-averse and damage-resistant. They are specially engineered using high quality, well-tested components. So what factors influence the quality and reliability of solid skid steer tires? Low-grade tires are made from inferior rubber, which is usually composed of a high percentage of synthetic rubber compounds. This makes them cheaper as rubber quality is compromised to manufacture a lower cost tire. Solid tires, on the other hand, have a higher percentage of natural rubber compounds. This is preferable as natural rubber is more durable. Natural rubber extends tire wear and service life. It also ensures that the tires are cut- and puncture resistant. There are different grades of natural rubber, ranging in quality. The higher the quality of the natural rubber used in the manufacture of solid tires, the higher the price of the tire. But what you spend in upfront cost is made up by the lower operating costs of equipping your skid steer with high-quality, long-wearing solid tires. Unfortunately, to cuts costs, some manufacturers mix in low-quality rubber compounds with high-grade rubber compounds. This reduces the durability of the tires, making them more prone to punctures, faster wear, and chunking. Carbon black is a material used as a reinforcing filler in rubber products. Most buyers only pay attention to the natural rubber composition of rubber tires but forget that the carbon black content is also critical. Why is carbon black so important? Carbon black extends tire wear and prevents tire chunking. High-grade carbon black in a solid tire is desirable, even though it does add to the cost of the tire. But this is a worthy expense because it helps extend the life of the tire by conducting heat away from the tread and belt area. Part of the reason for this is because of its a good electro-conductor. In short, you can’t have high-quality rubber tires without a good carbon black content. Before investing in solid tires, always check to see where exactly the tires were manufactured. Keep in mind that just because it says ‘Made in North America’ does not necessarily mean that all tire components were actually made in America. Tires made in countries like Indonesia and China often feature inferior ingredients such as low-grade rubber compounds or a high percentage of synthetic rubber compounds. The manufacturers in these countries also cut corners, adopting poor work processes, not paying adequate attention to details. At low temperatures, low-quality rubber tires tend to stiffen, making for an uncomfortable ride for the machine operator. But this is actually preventable. Top-of-the-line solid tire manufacturers usually include a special additive to the rubber composition that minimizes tire stiffening when it is cold. Otherwise, aside from stiffening and providing an uncomfortable ride for the operator, there is the risk of the tires cracking. This is a particular concern for heavy machine operators in northern climates. That’s why it’s typically advisable not to operate your machine during winter chills. But since Monster Tires only offers tires made of the finest quality rubber compounds, you can rest assured that operating your machinery on almost any worksite will not cause much of a challenge! Monster Tires Only Offers High-Quality Solid Tires! Here at Monster’s Tires, our solid tires are made from the highest quality rubber, mixed in with special additives, like carbon black, that reinforce the tire’s toughness and reduces stiffening in cold temperatures. Our tires are extremely durable and capable of handling the most demanding underfoot conditions, despite what many other tires cant deliver. They are puncture- and flat-proof, manufactured with best processes and only using well-tested, top-grade ingredients. Contact us for more information about our solid tires. This entry was posted in Solid Tires. Bookmark the permalink. MonsterTires.com is your resource for a wide selection of industrial tires, rubber tracks, steel tracks. We provide tires and tracks for the construction, mining, agriculture and building trades. How Are Solid Tires Secured to a Rim?